There I was, off the coast of North Carolina at a depth of about 20m (60ft) when the shadowy shape of the WWII wreck Caribsea came into view—but it looked almost as if it was moving! Upon closer inspection, it turned out to be a cloud of tiny bait fish completely covering the wreck. As they moved, the ship seemed to move with them; and then, out of the swarm, a massive, tank-like, gray silhouette emerged. It moved at one speed and in one direction, not altering its course an inch. I smiled so much my mask began to leak—it was a sand tiger shark. Sand tiger sharks on the wreck of the Caribsea, North Carolina, USA. Photo by Brandi Mueller. 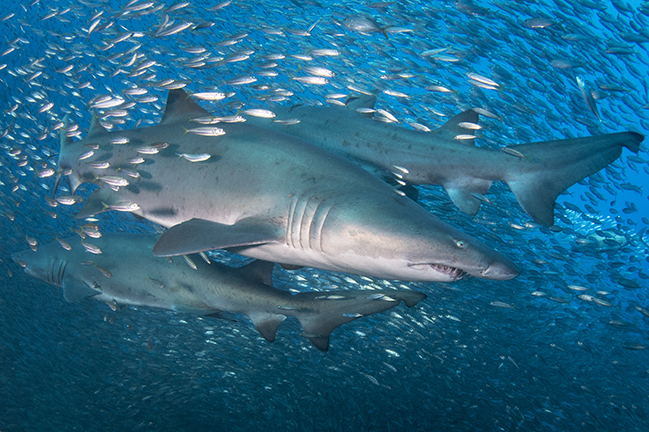 Sand tiger sharks (Carcharias taurus) look mean but in reality, they are quite docile. As I watched, at least 12 sharks crisscrossed the Caribsea wreck; they almost seemed to be in a perfect state of Zen. Easily identifiable by their pointy, cone-shaped heads (and also by their jagged and fierce-looking teeth, which show even when their mouths are closed), the tops of their bodies are a dark gray with darker colored spots, and their undersides are bright white. Their tails also have the unique characteristic of a notched upper lobe. At first glance, I thought perhaps the shark had a bite taken out of its tail, but I was wrong, they all have that. The sharks, which can grow longer than 3m (10ft) and weigh up to 150kg (330lb), seemed to emerge out of the shadows, or out of a blindingly dense bait ball, moving in a straight line at the same depth, not diverting in any way. They would just traverse the wreck, almost like rubber toys on some sort of conveyer belt—albeit, very large rubber toys. Maybe a better description would be a semi-truck slowly moving directly towards you, and you better get out of its way. Sand tigers can be found in warm or temperate waters around the world, but often in deep waters inaccessible to divers. North Carolina is a rare place where divers can consistently see them at recreational diving depths. This population seems to have taken up an interest in wreck diving (just like me) and many of the Graveyard of the Atlantic’s wrecks are populated with sand tiger sharks. The most popular wrecks on which to see them include the Caribsea, Atlas, Papoose, Spar and Aeolus. Sand tigers have several other common names in different places, including gray nurse sharks and ragged-tooth sharks or “raggies” due to their rows of intimidating, jagged, ragged teeth. The shark’s name is often a source of confusion as it is not actually a tiger shark; and its scientific name directly translates to “bull” shark, although it is not a bull shark either (bull sharks are Carcharhinus leucas). There are three additional species of sand tiger sharks: C. tricuspidatus, C. ferox and C. noronhai—all of which are generally found only in very deep water and rarely seen by divers. Even C. taurus can range in depth to almost 200m (656ft), making North Carolina a very unique place to be able to recreationally dive with them. On my second day of diving, we ventured to the Atlas wreck, another WWII shipwreck. Upon arriving at the wreck, another diver yelled, “Dolphin!” and we all ran to the port side of the dive boat. We could see a large shadow departing the surface, and it did not return. Our captain informed us that it was actually a sand tiger coming to the surface because these sharks have swim bladders. They are the only shark species that comes to the surface for breaths of air, which help them control their buoyancy underwater. These gulps of air help them to maintain their motionless movement, which makes them look so cool underwater; they move so stealth-like, they almost look as if they are not moving at all. Sand tigers, similar to most shark species, can detect electric currents through receptive pores under their snouts. Prey (and divers) emit electrical signals that the sharks can sense in the water column, alerting the sharks of our presence. This helps the sharks to hunt in bad visibility, although sand tigers also have considerably good vision; they can see in low-light conditions and can detect the difference between light and dark objects. Nighttime is usually when sand tigers hunt, and they prey on small fish, crustaceans, skates and squid. They have been known to group hunt as well, and hunting usually occurs close to the sea floor. Despite their big teeth and ferocious expression, sand tigers are not aggressive towards people. No documented cases of human deaths have been recorded, although incidences of human attacks have been recorded in association with spear-fishing and shark-feeding. They are sometimes known to be aggressive when trying to steal fish or bait from fishing lines. A few times underwater, I heard a large cracking noise, which was the almost sonic-boom-like sound of a sand tiger diverting its path. Whether it was from an attempt to catch some bait fish for dinner or because they were startled by something (one time, it was two sharks colliding into each other). The lightning speed of these sharks moving sounded like a thunder boom, which I think I could feel in my chest. Things get quite interesting when we look into the reproduction of sand tiger sharks. Due to their success in surviving captivity and aquariums, the reproduction of sand tigers is well known. In some sand tiger populations, including those from South Africa and Australia, a migration is associated with reproduction. Many will travel over 1,000km (620 miles) to mate in shallow waters during the winter and give birth in warmer waters in the summer. Young sharks are not seen on the migration, and it is thought that they may stay in deeper waters until maturity. Male sharks mature after five to seven years, and female sharks mature after seven to ten years. Courtship has been seen in aquariums. When females are ready to mate, they are seen hovering just above the bottom, “shielding” themselves to help prevent unwanted approaches from males from underneath. Males compete with one other to see who can get closest to the female, with the largest, alpha male usually winning. He will intimidate the others by snapping his tail and trying to drive them away from the female. Courting can take several days of the male and the female superficially biting each other. Sand tiger sharks are ovoviviparous, which means they give birth to fully developed, live young; but those young have been hatched from eggs inside the shark. Females usually only breed every two to three years, and the gestation period is around nine months. Usually, 15 to 25 eggs are fertilized internally. An egg yolk provides food for the developing embryo until the young is around 17cm (6.7in) long. This is when things get interesting. The largest embryo, or often the first to hatch, will begin to feed on the other, less-developed embryos to survive. This is known as intrauterine cannibalism, and sand tiger sharks are the only shark species known to do this. Around nine months later, the female will give birth to one or two 1m (3ft) long, fully developed baby sharks, which would have eaten the rest of their siblings. Sand tiger sharks are one of the most popular sharks to have in aquariums because they have shown to survive quite well in captivity. The North Carolina Aquarium at Pine Knoll Shores has a large exhibit with a replica U-352 boat and many large marine animals found in the nearby waters, including sand tigers. With so many sand tigers in captivity, a lot of research has been done, and that is partly why we know so much about these sharks. They have been shown to live 10 to 15 years in captivity, although we do not know how long they survive in the wild. Keeping sand tigers in aquariums has had benefits to science, and the sharks may help inspire people about the ocean, but keeping large animals in tanks much smaller than their natural environment is not without problems. Sand tigers kept in captivity have been shown to develop spinal deformities, probably due to tank size and from swimming in circles in one direction, causing asymmetrical stress on their bodies. Population data on the sand tigers is sparse, so they are listed as vulnerable on the International Union for Conservation of Nature's Red List. Like so many ocean creatures, sand tigers face many threats, the largest being their slow reproductive rates—they have one of the lowest reproductive rates of all shark species. However, off North Carolina, it seems the sand tiger shark population is plentiful, and they are found throughout the world’s oceans. Sand tigers have also been targets for shark finning, and they are a highly prized food item in some parts of the world. Their ability to survive captivity has led to many individuals being captured for aquariums (and reproduction rates in captivity are also low). Sand tiger sharks are often after the same fish as fishermen, which has made them unpopular in some places. Fishermen have been known to kill them to protect their catch, and there are even specific fishing competitions targeting them in places like South Africa. Young sand tigers often reside in shallow estuaries, which can be susceptible to pollution and run-off. Special thanks go to Crystal Coast Tourism Authority and Olympus Dive Center.